The name Traquair comes from tret or tre, a word of Celtic origin, meaning a dwelling place or hamlet, and from quair, meaning a stream with a winding course. The Quair burn joins the River Tweed a few hundred yards from the rear of the house. It is not know when the exact foundations of the house were laid, but a substantial structure must have existed by 1107 when Alexander 1 of Scotland signed a royal charter at Traquair. At this time, the castle was used as a hunting lodge for royalty and also as a base where they could administer justice, issue laws and hold courts. At Traquair, many charters still exist. One, signed in 1175, authorised William the Lion to found a Bishop's Burgh with a right to hold a market on Thursday. This small hamlet was later to become the City of Glasgow. During this period, Traquair was nestled in the middle of the vast Ettrick Forest and provided a superb venue for royal hunting parties who came to hunt wild cat, wolves, deer, wild boar and bears, who roamed the forest. A mural painting in the Museum, dating back to the early 1500s, depicts some of these early hunting scenes. After the death of Alexander III in 1286, the peaceful life of the Borders was shattered by the Wars of Independence. Traquair became one of the many fortified towers or peles that were built along the banks of the Tweed. When the alarm was raised, they could communicate to each other by lighting a beacon at the top of the tower and alert the neighbours of an English invasion. Traquair was briefly occupied by English troops, but returned to the Crown with the accession of Robert the Bruce in 1306. More peaceful times eventually returned to Traquair in the15th century and, when James III succeeded in 1460, he gave Traquair to his current favourite, Robert Lord Boyd, but when the gift was not appreciated, he gave the castle to his favourite court musician, William Rogers. However, he held Traquair for only nine years, when he was persuaded to sell it to the Earl of Buchan for the paltry sum of 70 Scots merks (£3 15s). During this period, Traquair made the transition from a defensive tower house into a family home. In the 1500s, the lairds of Traquair played important roles in public life with John Stuart, 4th Laird of Traquair, becoming the Captain of the Queen's bodyguard to Mary Queen of Scots. He was host to the Queen when she visited Traquair with her husband and baby son, James, in 1566. The cradle where she rocked her baby, her bed and some other possessions can still be seen in the house. During the 16th century, the main building was extended, so by 1599, the main body of the house was completed. Then in the early 1600's the 7th Laird added the top storey, realigned the windows and changed the course of the River Tweed so it ran further away from the house. The 7th Laird also became the most influential member of the family and he held the post of Lord High Treasurer of Scotland. He was granted an earldom in 1628 and three years later became Commissioner of Scotland. Unfortunately, his fidelity to the king and his attempt to bring Episcopacy to Scotland were to be his downfall. He lost his post, suffered heavy fines and was rumoured to have been seen begging in the streets of Edinburgh towards the end of his days. The Catholic tradition, which has remained in the house to this day, was established by John, 2nd Earl of Traquair. His second wife, Lady Anne Seton, was a strong Catholic and, despite the dangers of the day, was determined to bring her five children up as Catholics. Mass was said in secret in a small chamber on the top floor. 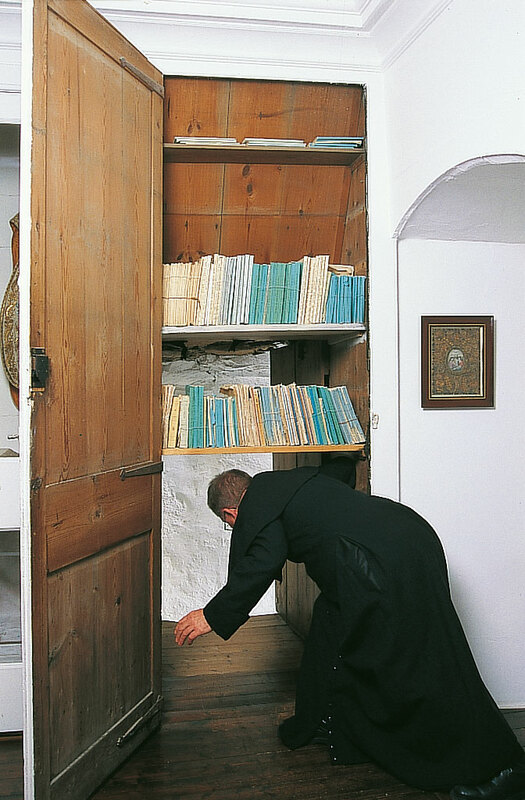 A secret escape route for the priest was hidden behind a concealed cupboard and led down the old stairs. It continued to be used until the Catholic Emancipation Act in 1828. The building of Traquair was completed in 1695 by the Edinburgh archietect, James Smith, who added the two side wings wings, erected the wrought iron screen in the the courtyard and at the rear of the house created a double terrace with two ogee roofed pavilions to overlook the formal gardens. For over three hundred years there have been no additions or alterations to the main house. In the early 1700s, the political situation in Scotland was very unsettled with James II now exiled in France and deposed by his Protestant daughter, Mary, and her husband, William of Orange. Charles, the fourth Earl remained loyal to James and became one of his band of supporters, known as the Jacobites, who worked secretly to restore the Stuarts to the throne. The political choices made by the Stuarts of Traquair, who also upheld their Catholic beliefs, led to some difficult and troubled years ahead from which the family never fully recovered. Shortly after his marriage to Mary, Charles, the fourth Earl was imprisoned in Edinburgh Castle, suspected of his involvement in a Jacobite plot. Later, he supported his sister-in-law, Lady Winifred Nithsdale, to help her husband as he took part in the first Jacobite rebellion of 1715. The uprising was doomed to failure and William Nithsdale was imprisoned in the Tower of London and sentenced to death. (The exciting account of his wife' successful attempt to rescue him can be read in Lady Nithsdale and The Jacobites by Flora Maxwell Stuart). The fifth Earl, also Charles, inherited his father's beliefs. 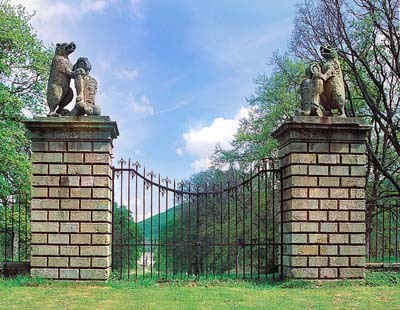 He installed the Bear Gates at the top of the avenue in 1738. However, they were only in use for six years, when according to legend, they were closed following a visit of Prince Charles Edward Stuart (Bonnie Prince Charlie). The Earl of Traquair vowed they would never be opened again until a Stuart king was crowned in London. Charles was imprisoned for his support of the Jacobite cause, after the 1745 rebellion. His new wife, Theresa Conyers, volunteered to join him. On his release he was "confined to his estates" but he was responsible for much of the remodelling of the interior of the house in a manner reflecting the Scottish renaissance. The High Drawing Room and the Library are stunning examples of the European influence on Scottish country houses at that time. Following the death of the fifth Earl, his brother inherited the earldom and this marked the beginning of the period of slow decline for the family. Following the death of his wife, Christina Anstruther, he moved to Paris with his two unmarried daughters and handed Traquair over to his son Charles, later to become the seventh Earl. His family were beset by financial problems, due in part to his gambling and unsuccessful explorations for mining for minerals on the estate and later in Spain. Traquair in the nineteenth century was a house in decline. Charles, the eighth Earl, inherited a large financial debt from his father, but although he was forced to reduce the size of the estate, he was able to implement a progressive policy of modernisation and farm building. Unfortunately, he never married but he did have his share of eccentricities and thwarted his family's attempts to find him a wife, by putting stinging nettles in the beds of his female admirers. As Charles had no children, Traquair passed to his Lady Louisa Stuart in 1875. She lived on for another 14 years, dying in her 100th year and reputedly was a great friend of Sir Walter Scott, whom she visited at Abbotsford, just over the hills from Traquair. After the death of the last Earl, the earldom became extinct as the title could only pass through a male heir. Traquair was then passed to the nearest cousin, Henry Constable Maxwell of Terregles. He added the name Stuart to his own. The Maxwell family were also recusant Catholics, who had remained faithful to their religion, and they had great respect for Traquair. Henry and his wife, Juliana Middleton, brought up their large family between Yorkshire and Scotland. After Henry's death, Traquair passed to his eldest son, Herbert, a great collector of precious stones, with a love of shooting, which the game book at Traquair records. He was followed by his younger brother, Arthur, who was in his nineties when he inherited Traquair, who then passed it to his eldest nephew, Frank Maxwell Stuart, who became the 19th Laird of Traquair. Frank was the eldest of twelve children and four of his brothers had been lost as young men in the First World War. When he inherited the house, it was badly in need of repair but the Second World War had just broken out and Frank volunteered as a bomb disposal expert, leaving his wife, Dorothy, at Traquair where she lived with oil lamps and little heating throughout the next six years. After the war was over and the new Labour government began to give grants to restore historic houses, Frank began uncovering some of the great treasures of Traquair: the 17th century painted beams in the High Drawing Room, the remarkable tapestries and needlework that had been carefully packed away in trunks and the superb collection of Jacobite glass. Frank opened the house in 1953, showing groups of visitors around a few of the rooms in the house on two afternoons a week. However, when his son, Peter, inherited in 1963, it was clear that in order to maintain the house and tackle the repairs, the house was going to need a much larger income than the estate could provide. Peter gave up his job with Haig whisky and together with his wife, Flora, they devoted the next thirty years of their life in developing Traquair into the tourist attraction it is today. This included bringing the 18th century brewery back to life and becoming the first domestic brewery in the UK for many years to hold a commercial brewing licence. In 1990, Peter died, leaving the house to his wife, Flora, and their daughter, Catherine. Together they ran Traquair for the next 10 years, beginning to host weddings, receiving guests on a bed and breakfast basis and developing an annual programme of summer events. In 1999, Flora married the film director, Robin Crichton, and retired, handing the house over to her daughter, Catherine, and a Charitable Trust. It is now the family home of Catherine, 21st Lady of Traquair, her husband, Mark Muller, and their three children.